Indian National Congress Candidate for Mandi Parliamentary Constituency Pratibha Singh has filed her nomination today at Deputy Commissioner Office in Mandi for ensuing Lok Sabha elections.She has been accompanied by Shri Kaul Singh Thakur, Minister for Health, Shri Anil Sharma, Minister for Panchayati Raj and Shri Vikramaditya Singh, President, Himachal Pradesh Youth Congress.Smt. 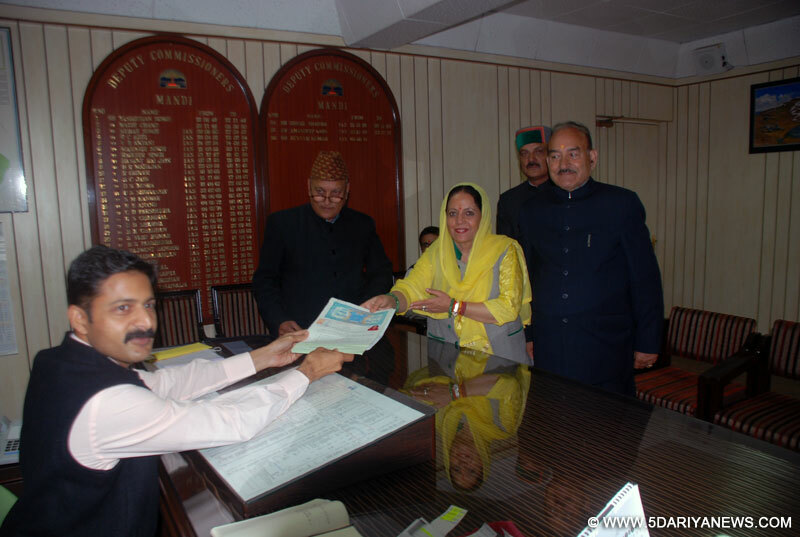 Pratibha Singh, wife of Himachal Pradesh Chief Minister is seeking to retain her seat for the third time from the Mandi Parliamentary constituency. Speaking on this occasion Smt.Pratibha Singh said that people of Mandi Constituency have acknowledged the development activities, which she has undertaken in past and he is confident that people with vote her with thumping majority. She has promised for the development of railway infrastructure in the Himalayan state which so far is serviced by toy train trains.Smt Pratibha Singh belongs to the erstwhile royal family of Keonthal state. She got elected twice from Mandi Parliamentary Constituency in 2004 and 2012.Dismissing any Modi wave in Himachal Pradesh, she said people will vote based on the developments brought about by her in the constituency, which is the second biggest in the country after Barmer in Rajasthan.Due to geographical conditions and unpredictable climate reaching out to the voters in the fur-flung areas is a big challenge. Reacting to this she said; "Monsoon is a problem reaching fur-flung areas. I cannot go because of snowfall but I have told my supporters and party workers to start the campaigning process as elections are not far away," she said.The Mandi parliamentary constituency comprises the tribal dominated assembly constituencies of Kinnaur, Lahaul and Spiti and Bhermour.Smt. Pratibha Singh the won the Mandi parliamentary bi-poll last year by defeating Jai Ram Thakur of BJP by over 1.30 lakh votes.While sharing her future agenda she said; "My priorities this time would be expanding the railway network as Himachal is lagging behind other states. I have raised the issue in Parliament several. Now I will try to expedite it. I spoke to the then Railway Minister Lalu Prasad and he had shown keen interest for proper rail connectivity to the state. But nothing much happened after that, " .She has mentioned that the state government has agreed to provide land and bear 50 per cent of the cost of the project.